A strange tickling sensation on my back woke me up. The second I jolted back to life, I sensed an ethereal feeling of lightness, like I was floating in the air. I opened my eyes and chuckled. I was in the Vytautas Mineral Spa in Birštonas, Lithuania, in a pool filled with mineral water so dense with salt and minerals that there was nothing my body could do but float, just like in the Dead Sea. Below me, a jet produced a cloud of little bubbles. A cushion kept my neck and head steady and I’d dozed off, just minutes after getting into the pool. The bubbles continued to tickle my back but it was one of the most relaxing sensations I’d ever felt. Aware of where I was, I closed my eyes again. Birstonas is surrounded by expansive pine tree forests. Birštonas (map) is a small spa town, located approximately 90km west of Vilnius, the capital of Lithuania. Famed for its salty mineral water and mud, Birštonas saw the opening of its first spa resort in the 19th century. The curative properties of the water and mud attracted people from all over the Baltic region, Russia and Poland. These days, Birštonas boasts a variety of spa resorts and medical spas. Visitors come here to relax, rejuvenate or rehabilitate from an injury or ailment. Situated on the banks of the Nemunas River, Birštonas is surrounded by expansive pine forests, which makes it perfect for another rejuvenating activity: forest-bathing (or shinyin roku). One thing I quickly noticed was how reasonably-priced the spa hotels and treatments are, especially for Western European or North American standards. Prices vary across the seasons but I found packages that include accommodation, meals and treatments from €70 per person! Vytautas Mineral Spa sits atop a 715m deep source of mineral-rich spring water. The water contains 70+ minerals and is so dense, it comes close to resembling the properties of the Dead Sea! Vytautas Mineral Spa faces a small lake with a beach. Image courtesy of Vytautas Mineral Spa. This modern spa resort made the biggest impression on me, primarily due to its stunning contemporary design. As I stepped into its airy atrium lobby, my gaze was directed to the amazing spiral staircase. Next to it was a kiosk where I tasted the famed Vytautas mineral water for the first time. The stunning spiral staircase is the first thing visitors see when they enter the lobby. The staircase seen from the upper floors. There were many other delights in store for me during my short stay at Vytautas Mineral Spa such as the floating experience in the spa, the relaxing Tibetan hot stone treatment, the beautiful rooms, the incredible library and the terrific food! I loved the colourful rooms at Vytautas Mineral Spa, a gorgeous blend of minimalist design and modern comforts. This room, with its separate living area, a large bathroom and two balconies, was my address for the night! I also checked out this room which featured flamingos on the walls! The elegant, functional design of the spa is certainly pleasing to the eye. The relaxation room in the spa (image courtesy of Vytautas Mineral Spa). This is where I had my amazing floating experience! The design of the spa and the lighting is just stunning! Image courtesy of Vytautas Mineral Spa. The salt room resembles some sort of sci-fi salt cave! Image courtesy of Vytautas Mineral Spa. The other spaces in the building were equally eye-catching! The library is an incredible place! It’s like sitting on the moon with a view of Earth in the distance. The artwork in the library’s dome is amazing! Moon Restaurant is large but with an intimate feel. The chef of Restaurant Moon cleverly combines seasonal ingredients, mostly sourced locally, with sophisticated techniques. Simply top-notch! The personnel, from the professional therapists in the spa to the restaurant staff, were very good and made me feel right at home. The floating treatment, followed by the Tibetan massage, left me feeling so relaxed. Needless to say, I had a fantastic time at Vytautas Mineral Spa (link to Bookingcom). My only regret was that I couldn’t stay longer. Egles Sanatorium is located at the edge of Birštonas Central Park, surrounded by towering pine trees. Due to its location in the forest, it’s not until you enter that you begin to see how vast this complex is. The Egles Sanatorium has more of a medical spa character – they have more than 100 (!) treatments in the fields of kinesitherapy, psychotherapy, massages, therapeutic baths, therapeutic mud treatments and mechanical physiotherapy. There’s a beautiful day spa for visitors but I recommend staying longer (from a weekend to two weeks) at Egles (link to Bookingcom) to truly benefit from the wide range of treatments. The lobby lounge and bar at Egles Sanatorium. The mineral water drinking fountains at Egles. The Royal Spa Residence is also nestled in the forest, a short distance from the Nemunas River. I had the opportunity to visit this spa and enjoy a massage. The Royal Spa Residence follows the wellness principles of Sebastian Kneipp, a German priest who developed this influential health philosophy in the 19th century. The Kneipp principles are reflected in the many treatments but also in the food. In addition, there’s a Kneipp wellness circuit in the resort’s grounds which guests can follow. Some of the rooms at the Royal Spa Residence offer views of both the forest and the river. The spa at Royal Spa Residence. The pool (image courtesy of Royal Spa Residence). My therapist at the Royal Spa Residence deserves a special mention because of his skills and professionalism. He inquired about any injuries or allergies I had and I mentioned my stiff left shoulder/arm which was a remnant from an accident I suffered more than a year ago. He expertly worked on my shoulder and relieved a lot of the tension. As I type this, I can still feel the effects of his brilliant work! I’m confident that if I’d had more time to spend in Birštonas and underwent several more treatments with this therapist, my shoulder would be 100% healed. That’s another reason why I shall return to Birštonas! 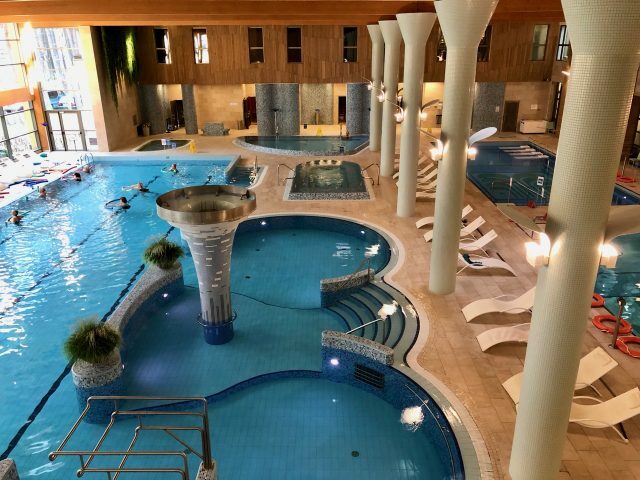 The spa resorts and medical spas all offer a wide variety of treatments but venture into Birštonas town and its surroundings, and you’ll discover other ways in which the town integrates wellness into its lifestyle. Climb to the top of Vytautas Hill, one of the highest points in Lithuania, for beautiful views of the town, the forests and the Nemunas River. Birštonas is surrounded by large swathes of protected pine forests. In the town itself, you’ll find the Vytautas Hill park and Central Park. Take the boat across the Nemunas River and there are more forests to stroll around in. With their towering pine trees, the forests are perfect for the Japanese wellness form of shinyin roku (forest bathing). This wellness form basically means taking in the forest through our senses while on a gentle stroll. There are also opportunities for a more active approach – you can climb the many steps to the top of Vytautas Hill for a beautiful view of the river, and in Central Park and Žvėrinčius forest, there are various exercise stations and jogging/cycling paths. Whichever approach you choose, the fresh air and greenery will work wonders on you. The wellness philosophy of Sebastian Kneipp, a German priest and naturologist who lived in the 19th century, is avidly promoted by Birštonas. This philosophy is based on the five basic principles of water, plants, exercise, nutrition and balance for a healthy life. In the Kneipp Garden, visitors can follow a wellness circuit that embraces the five Kneipp principles. And it’s free! The Kneipp Garden wellness circuit. Instructions on how to use the circuit. This is something I hadn’t heard of before until I visited Birštonas. Various resorts have salt rooms or caves where the salt-laden mineral water seeps down the walls. The air is saturated with salt and minerals and inhaling this air is said to be beneficial to the respiratory system. In Birštonas, visit the Birutes Vila (free entrance) and relax while you breathe in the air for twenty minutes. Another extraordinary place to inhale this mineral-laden air is at the Druskupis pavilion at the edge of Central Park, opposite the Egles Medical Spa. This open-air pavilion features walls made of compressed twigs where mineral water seeps down and slowly evaporates, creating the effect of ‘sea air’ – look closely and you’ll see the salt crystals on the twigs. A kiosk where you can have a sip of the mineral water. There are many mineral water springs scattered around Birštonas, each with a different mineral composition and taste. The water is known for its curative properties and as with many medicines, they seldom taste and smell good (depending on the level of sulphur content) – it’s advisable to take only a few sips at a time. I’ve been a firm believer of the curative capabilities of water with a high mineral content since my first experience drinking it at a thermal bath in Budapest years ago; the water helped to alleviate a stomach ailment I was suffering from at the time. The spas have their own kiosks where you can drink the water but there are also public kiosks in the parks. The small Birštonas Museum is housed in a lovely building and offers an overview of the history of the town, particularly in relation to the mineral springs. 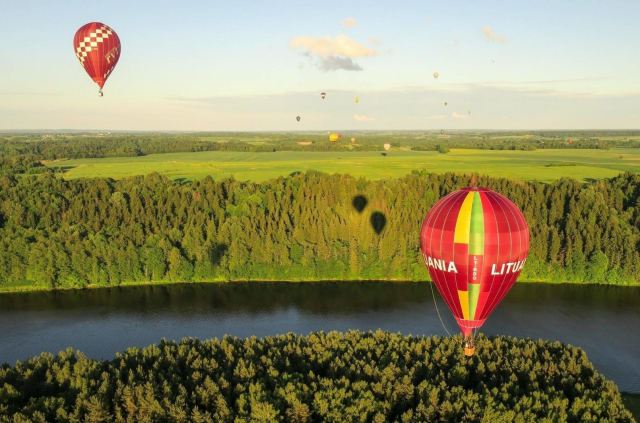 On clear days, it’s possible to go on a serene hot-air balloon ride over Birštonas, the forests and the Nemunas River. Hot air balloons over Birstonas (image courtesy of Birstonas Tourism). Staying true to the Kneipp wellness philosophy, Birštonas offers a big variety of exercise options. There are many walking and cycling trails in the parks and forests, such as the 15km trail in the Žvėrinčius forest. There’s also a beautiful path that follows the meandering Nemunas River, perfect for a leisurely stroll, jog or bicycle ride. There are also water-based activities such as canoeing and SUP. There are regular flights from major European cities to both Vilnius (90km from Birštonas) and Kaunas (30km) airports. From these two cities, there are frequent bus services to Birštonas. If you’ve booked a stay at one of the hotels, they can also arrange airport transfers directly from the airport. For more information, visit Birštonas Tourism. Read about my day trip to Kaunas, Lithuania’s second largest city. Note: my visit to Birštonas was made possible by the Lithuanian Ministry of Foreign Affairs, Birštonas Tourism and Vytautas Mineral Spa. As always, all views expressed above are mine, and mine only.